opportunities. You get the best of everything here, and that���s been a great recruiting tool. We take a lot of pride in our employees living in a community where they���re happy, and the people here have helped make that happen. Our technology center for the cable business is in Sweden, and we brought over about 10 people from there. They���ve been living with their families in our community, and initially their children struggled to learn English. Huntersville Mayor Jill Swain stepped up and got directly involved with the school to recruit a tutor to help the children with translations. It was very impressive and went a long way with our Swedish colleagues and in solidifying our relationship with the town. Patton: Coming from the Midwest, we were amazed that the beach was only an hour or so from Kinston. It wasn���t long after we ���rst started coming here that we were going to the beach. Within a few hours, you can be at the beach or in Charlotte ��� why wouldn���t you want to live here? Kuhn: The lower cost of living in North Carolina is de���nitely an advantage. Our other manufacturing sites are in Los Angeles and on Long Island in New York. I try to get people to move from site to site, but I can���t get anyone to go to either of those places. 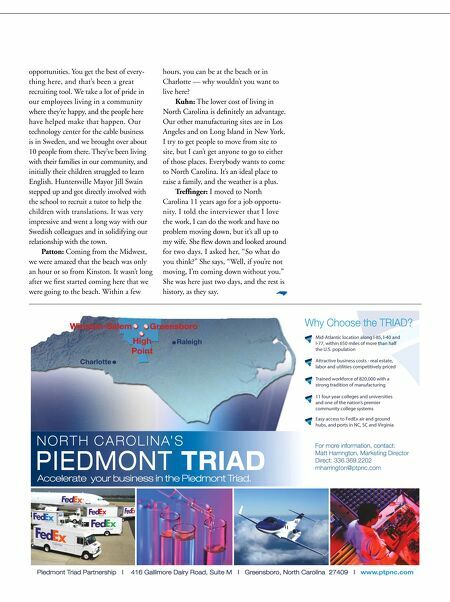 Everybody wants to come to North Carolina. It���s an ideal place to raise a family, and the weather is a plus. Tref���nger: I moved to North Carolina 11 years ago for a job opportunity. I told the interviewer that I love the work, I can do the work and have no problem moving down, but it���s all up to my wife. She ���ew down and looked around for two days. I asked her, ���So what do you think?��� She says, ���Well, if you���re not moving, I���m coming down without you.��� She was here just two days, and the rest is history, as they say.